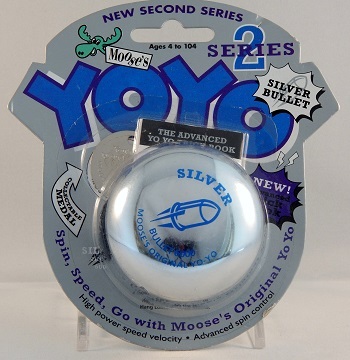 From Moose's Series 2 line, a silver plated, tournament shaped yo-yo with a metal axle and starburst response. Not to be confused with the original Silver Bullet yo-yo from Tom Kuhn. Came with an advanced yo-yo trick sheet and one silver collectible medallion.